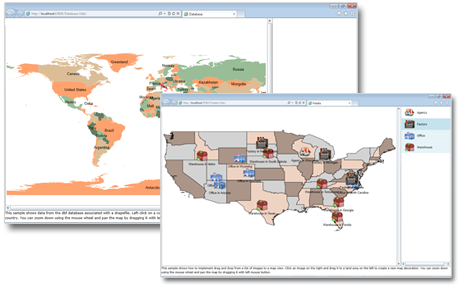 Fast and easy way to add great looking maps into your Silverlight application. The component gives you the power to create, decorate, customize and display any type of map without putting the effort and money to develop the functionality from scratch. 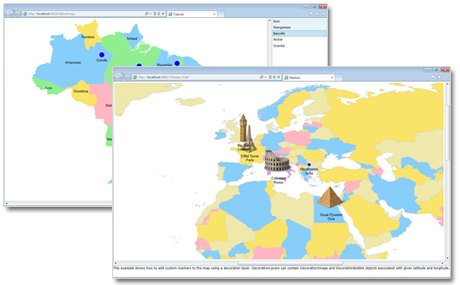 It's a unique tool which leverages the latest Silverlight technology to deliver eye-catching maps for your software. Mark the special locations at your map with custom markers - images and text that you can place at precise locations of your choice. map can contain as many layers as necessary. Use them to place geographical or administrative data relative to the map that you are showing - cities, rivers, notable places, numbers and figures etc. With the built-in drag and drop functionality you can create a palette of custom objects (images with labels) and let users place them at the map. MindFusion.Mapping for Silverlight offers you a big choice on royalty free files with a lot of administrative, geographical and political data, which you can use to mark cities, territories, roads, countries, oceans and many more. The advanced pan and zoom features of the control let you bring fast and easy any portion of the map in the visible area of the screen simply by dragging the map or scrolling the mouse wheel.